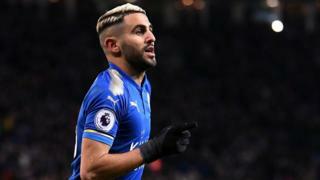 Leicester winger Riyad Mahrez don train with di first team for di first time since di January plans for am to transfer go Manchester City no happen. Di 26-year-old never follow im team-mates train since when Leicester bin reject £50m deal from di Premier League leaders on deadline day. On Thursday 9 February, Foxes coach Claude Puel talk say im no go select Mahrez for Saturday match against Manchester City. E no dey clear now whether as di midfielder don train today, di manager go change im mind for tomorrow game. Mahrez never play for Leicester since 20 January. Who go win di CAF African Footballer Of The Year?